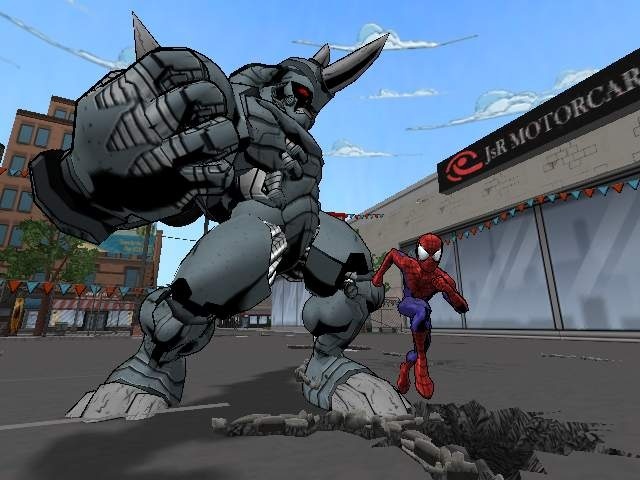 Ultimate Spider-Man was a great comic book series. The game of the same name was also quite good. Mentioned many times on SuperPhillip Central as one of the best Spider-Man games ever devised, you might be wondering why we say that continually. Here's the review of the game for our answer. From 2000 to 2009, Ultimate Spider-Man existed as part of a new universe of Ultimate comics from Marvel. During the midpoint of its original run, Activision and Treyarch brought forth a video game based on the comic book series. 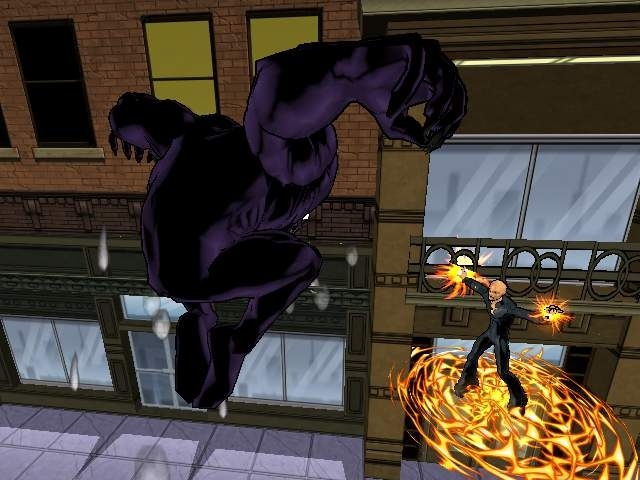 Using an art style that was reminiscent of the comic books the game was modeled after, Ultimate Spider-Man released in 2005 to great success. Was there good reason for this success, or you should you neglect to fall into Spider-Man's web? 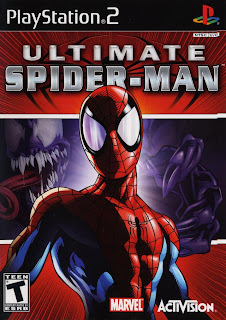 The story of Ultimate Spider-Man the video game begins with the Venom saga of the comic book of the same name. Peter Parker and Eddie Brock's fathers were working on a special Venom suit that would heal the wearer, particularly to cure cancer. Peter, as Spider-Man takes the suit out for a spin. While it gives him a boost to his superhuman powers, the suit tries to consume him, leaving him in a weakened state. When Eddie finds this out, he wants to see the power of the suit for himself, thus becoming the creature known as Venom. The writing in the game and witticisms by Spider-Man are as good as what is found in the Ultimate Spider-Man comic book, both written by all-star Brian Michael Bendis. 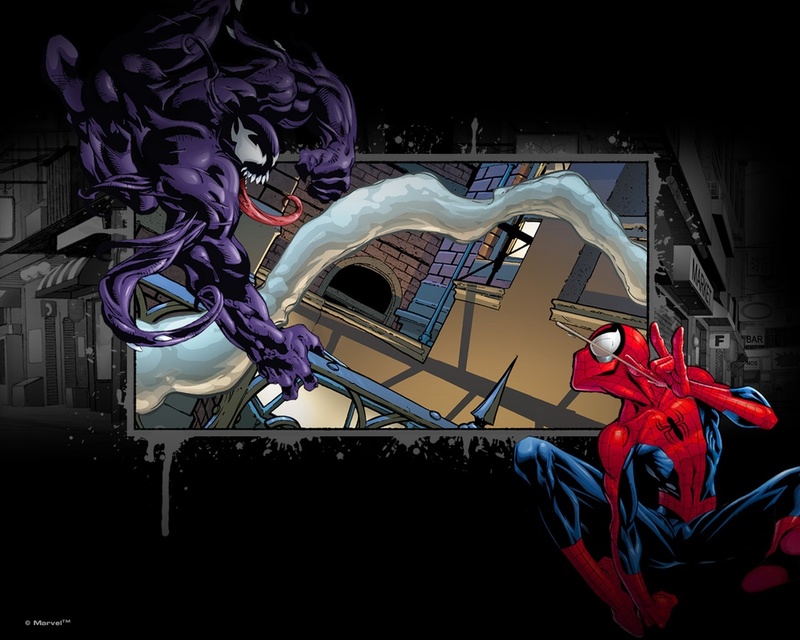 Ultimate Spider-Man's short campaign (approximately 5-6 hours long) has you switching between the old webhead and Venom, occasionally having the two cross paths in the story. Story missions contain things like chase sequences, rescuing civilians, and boss battles with Ultimate versions of familiar foes like Rhino, Electro, the Green Goblin and more. While the campaign is short, there is plenty outside of the story to do. In fact, in order to progress to the next part of the story, Spidey will need to complete City Goals. These are tasks like collecting certain objects, saving denizens from danger and attacking gangs committing crimes. Speaking of collecting, there is plenty to nab. There are loads of secret tokens to be found within the open world confines of Queens and Manhattan, there are icons that unlock comic book covers from the Ultimate Spider-Man comic book series, there's combat tours, where Spider-Man must go from point to point, taking out enemies, and there's waypoint races to be completed. Completing these unlocks new abilities for Spider-Man as well as unlockable costumes. of Manhattan certainly lights up the joint. As stated, Ultimate Spider-Man mixes things up by having you take on the roles of Spider-Man and Venom. Spider-Man has a more streamlined approach to his web swinging than what was seen in Spider-Man 2. However, like Spider-Man 2, Spidey must be near a building to web swing by it. 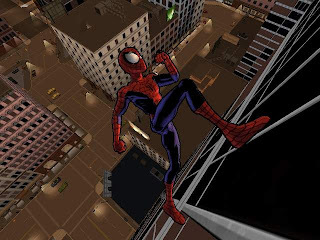 He can perform a Web Rush by having you press the shoulder buttons to cross over long distances much faster than normal, as well as climb the walls of buildings. Taking down foes is no problem with Spider-Man's spider sense. When the prompt is displayed over his head, that's your cue to jump out of danger's way. What, were you expecting Tarzan? 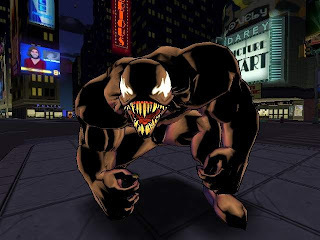 On the other hand, Venom is a completely different beast-- literally. He does not have any web-swinging abilities. Instead, he can leap large distances with a press of the right shoulder button. The suit Eddie Brock wears is constantly feeding on him, wishing to consume his very essence. In order to avoid this, Brock must use the Venom suit to feed on enemies in addition to unlucky, innocent New Yorkers. Otherwise his health will continue to deplete. It's a shame that a game like Ultimate Spider-Man didn't show up on a system on this generation, as not only would the cel-shaded comic book art style look even more fantastic than it already does, but a lot of the technical issues that haunt the game would probably be gone or at least remedied a bit. For instance, the draw distance isn't the most impressive and there is a consistent amount of objects popping up into the environment out of nowhere, especially with regard to vehicles. None of this really affects the gameplay, but they are without a doubt noticeable and could bring down the experience to some players. 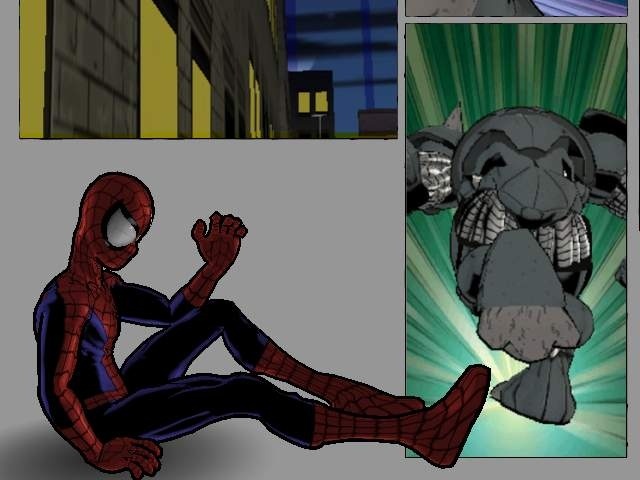 The cutscenes are really well done in Ultimate Spider-Man. They are made to look just like comic book panels, but with some pizzazz. Seeing Venom leap out from one panel with the camera panning with him into another panel is an awesome sight. The voice acting is really good, adding to each event that happens in the story. Overall, Ultimate Spider-Man is not the perfect Spider-Man game, but it is the closest 3D entry to approach that benchmark. 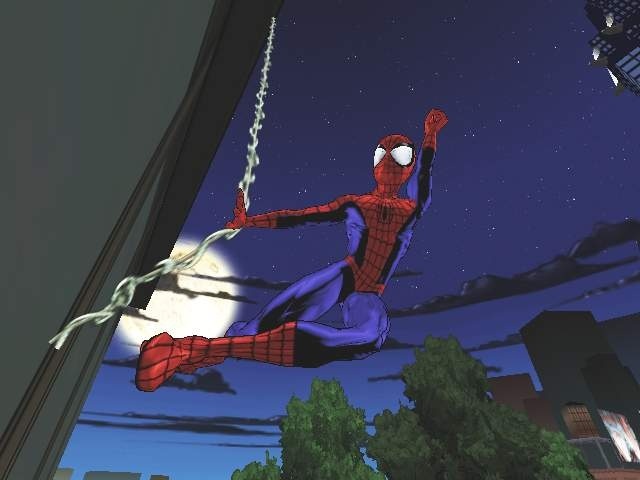 From its gorgeous cel-shaded art style to its myriad of side tasks that make the short campaign not seem so bad, Ultimate Spider-Man delivers the web-slinging charm that fans of the webhead will no doubt enjoy.